The maxim is true: Anyone can be a publisher on the Web and many Internet users are. They have contributed to the online commons by creating or contributing to Web sites, posting photos, and sharing files. They are taking advantage of new Web applications like blogging and, in many cases, faster, bigger Internet connections to facilitate their contributions. In a survey fielded between March 12 and May 20, 2003, the Pew Internet & American Life Project sought to measure the extent of these phenomena. Using a broad and encompassing definition of “content creation,” we found that 44% of adult American Internet users – more than 53 million people – have contributed material to the online world. Content creation in our definition includes creating a Web site, posting material to another Web site for work, family or another organization, posting materials to a personal or another person’s Weblog or online diary. It also includes posting photos, artwork, writing, or audio and video files to the World Wide Web, to a chat room or discussion or newsgroup or to a central server for sharing with others. The average number of content creating activities for a content creator is relatively small – 1.7 activities – and that suggests the most Internet users are content for now to find a small number of ways to make their contribution. 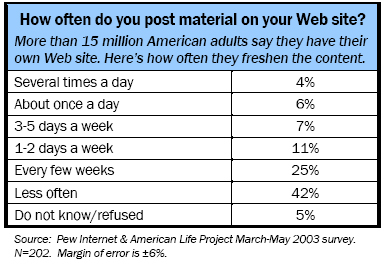 Some 13% of Internet users have their own Web site. Most do not refresh the material on their site very often: 10% of Web site owners post to their sites daily or more often, but the plurality (42%) update their site once a month or less often. A relatively small portion of other users has contributed information to a Web site. Four percent have contributed to a family Web site, 8% have contributed to a Web site for a business and 7% contributed to a Web site for an organization they belonged to, like a club, a church or a professional group. 30% of all Internet users have visited the Web sites of other families or individuals. Web cams, short for Web cameras, are small video cameras that are attached to a computer that broadcasts live video or still shots of the person at the computer across the Internet or to a Web page. Some 7% of all Internet users have ever used a Web cam to post live images to a Web site. Somewhat less than half (40%) of Web cam users use Web cams while chatting with someone else. In this survey, we found that a mere 2% of Internet users in this survey reported writing a weblog or online diary. Earlier surveys and a follow up check in early 2004 indicate that between 2% and 7% of Internet users publish a ‘blog. Within this tiny group, only about 10% report updating their blog daily. Most weblog writers update their blogs once a week or less often. Even though only a small number of Internet users are writing blogs, a slightly larger number of Net users are visiting them. Eleven percent of Internet users report visiting blogs written by others. And of these blog readers, a third report posting to or commenting on the blog entries that they have read. Blog readers most frequently visit the online diaries of friends (56% have done so), strangers (46% have visited the blogs of people they have never met) and family members (a quarter report visiting family blogs). Whether or not they have created original content to the Internet world, a greater percentage (though still not an overwhelming number of users) make content available online. One in five Internet users report posting photographs to the net, and 17% of Internet users have posted writing. Just about 5% of Internet users have posted artwork, audio files or video files to the Internet. Some user are not just posting for others to view, some are actively sharing files. Twenty one percent of Internet users allow others to download files from their computer, including music and video files. Surprisingly, Content Creators are less likely to say they download music than other Internet users. And as we reported more extensively in our recent Music Downloading Memo,2 two-thirds of these filesharers do not care about the copyright status of the files they share. One in five Internet users report visiting online newsgroups, forums where users can post their thoughts to a discussion that takes place over time. More than half of newsgroup users have posted comments to newsgroups, but a mere 4% have used newsgroups as a way to share photo, audio or video files. Who creates content? Content creators as a group are younger than the average American. However, in the Internet population, all age cohorts are equally as likely to create content. Content creators are more likely to be urban and suburban than rural, perhaps explained by the greater levels of broadband connectivity in urban centers than in rural areas. Content creators as a group are evenly divide between men and women and show similar racial and ethnic breakdowns as Internet users as whole. Content creators are likely to have higher levels of education – 46% have a college degree or more compared to 26% of all Americans. Income levels are also generally higher among content creators, with 31% living in households earning more that $75,000 annually, compared to 18% of all Americans who live in such households. Content creators are also disproportionately likely to be students—20% of all content creators are full-time or part-time students (about evenly split between the two groups), while only 14% of Americans identify themselves as students. However, given that many universities offer extremely high bandwidth facilities to their students and may make creating online content a part of the required coursework for a student, its not surprising that students are so well represented among content creators. Broadband connectivity is somewhat more prevalent in the homes of content creators than other Internet users—37% have high-speed connections of some kind, compared to 29% of all Internet users. In a more in-depth analysis of content creators, the Project noticed that there are three distinct groups of Internet users who create content: Power creators, Older creators and Content Omnivores. These creators are much younger than the other two types of creators, with an average age of 25 (compared to 58 in the Older group and 40 for the Omnivores). They are slightly more likely to be male (56% of the group). Race and ethnicity are not much of a factor—this group looks like the Internet population at large, with a slightly larger percentage of Hispanics. Eighteen percent of this group identify themselves as Hispanic, compared to 11% of the whole Internet-using population. The youth of this group informs many of the activities that they do. Instant messaging is extremely popular with this group, with two-thirds saying that have used instant messaging. Online game playing is also prevalent in this group with more than half participating in this activity. Statistically, young people are a more mobile as a group than older Americans, and Power content creators are no exception. This group is far more likely to search online for a job (63%) or a place to live (50%) than other creators. In another nod to youth, this group also downloads music at a much greater rate than their other content creating compatriots, and are far more likely to report posting audio files and artwork to a Web site. Power creators might also be called the Bloggers—12% of this group has a blog and close to a third (29%) has ever visited one, compared to less than 3% of other creators, and much lower levels of reported blog visits in the other two groups. Power creators are also the most likely of all creators to have broadband Internet access—40% of power creators have high-speed access. Older creators are most notable for their greater age—the average for this group is 58. This group of creators are long-time users—the average length of time online for older creators is 6 years, making older creators simultaneously experienced users. The average age of this group may also explain the high level of retirees—22% of Older creators are retired, and about half work full-time. Older creators along with Content omnivores are a highly educated group—half of each group has a college degree or graduate degree, and another quarter have some college experience. The incomes of Older creators are also high—more than 50% earn more than $50,000 annually in household income. Older creators are also not likely to be parents of children under 18 living at home. Less than 16% live with a minor child in their household. Thirty-one percent of Power creators and almost 70% of Content omnivore (see following section) are the parent or guardians of resident children. This group is also more likely than other content creators to live in rural areas, a factor which may partially explain their somewhat lower level of broadband internet access. Nevertheless the 36% of older creators with broadband is more than the 31% of American Internet-using households with high-speed access. This group is the least likely to live in an urban area. This group does not engage in a particularly wide variety of online activities. Older creators’ main content creation activity is the building and maintenance of a personal Web site. More than a third (34%) of this group has its own personal Web site. They are also just as likely to use a Web cam (18%) and post photos (36%) and video (8%) to a Web site as power creators. They are just as likely or slightly more likely than other creators to have contributed to or maintain a Web site for a business or an organization. Similar to other older Americans, Older creators are also more enthusiastic about online genealogical activities than other creators—a third (33%) have ever searched online for information about their family history. Content omnivores as a group have tried more of all kinds of Internet activities—including content creating ones. They are online frequently, and are more likely than other creators to have emailed, read news or surfed for information on a favorite hobby on a typical day. Still, they differ from power creators in that they have not embraced the newest of the new—most have never used a Web cam (only 13% have), and they do not keep a blog (3% do), though they do visit them, with 17% of Omnivores having ever visited the blog of a friend, relative or stranger. Omnivores are the workhorses of the content creating crowd—they are online all the time and they also work full-time, with 75% employed full-time and another 7% employed part-time. Surprisingly, another 12% are students. These content creators are, like Older creators, highly educated with high incomes, with half with a college or graduate degree, and half with incomes over $50,000 annually. Omnivores mostly live in suburban (52%) or urban (31%) areas. This group is also contains a slightly larger percentage of women (53% women, 47% men), and is overwhelming made up of parents—69% have children under 18 living at home. Content omnivores are, by a very slightly margin, the least likely of all content creators to have broadband Internet access. Nevertheless, they are frequent and dedicated users of the Internet and have tried a wide variety of activities. Omnivores seek finance information online (60% have ever done so), visit government Web sites (79% have), buy products and purchase travel online (78% and 73% respectively). When creating their own content, Omnivores tend toward more tried and true content areas on the Web. More than a quarter (28%) have their own Web site, and they are just as likely as other creators to have contributed to a family, business or organizational Web site. They have posted photos online (30%) as well as pieces of writing (27%). This group shies away from newer or more fraught content creating or sharing technologies. A little less than a third (31%) have downloaded music (similar to the number of Omnivores who sought religious information online), and only 4% have ever posted audio or video files, and only 6% have ever shared any artwork. As mentioned before only 13% have ever used a Webcam, and only 3% (compared to 12% of power users) have a blog.